As a property manager, you’re expected to organize and manage all facility services to create a happy, healthy environment for your employees and guests. It’s important to maintain a clean building, and doing as such requires the help of a commercial cleaning company that has the tools and training to create optimal results. Reliability and thoroughness are required for long-term cleanliness, and investing in services such as professional carpet cleaning can help to maintain a clean appearance for your property every day of the year. Crystal Clear Enterprise is proud to serve as your source for janitorial and carpet cleaning services in Kansas City. For more than two decades, our trained and certified janitorial staff has worked to set the standard for floor cleaning services and beyond, delivering amazing results everytime we set foot in the building. Commercial floor cleaning is provided to keep your property looking great for the long term, and it can help to improve the longevity of your flooring. 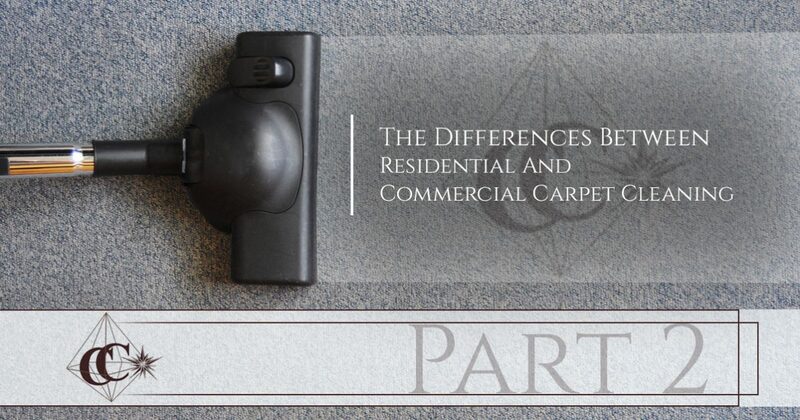 One common occurrence we’ve seen in our 21 years of business is the confusion in differences between residential and commercial carpet needs. Today, we’ll continue to discuss these differences, as well as the value of working with our janitorial company in Kansas City. If you are here because you are looking for a professional cleaning crew, be sure to contact us for a quote! The cost of commercial carpets over their residential counterparts is justified when you consider the level of traffic that your business can expect on a daily basis. Residential carpets are built to provide comfort while commercial-grade options are built to last, withstanding heavy use for years. While the fabrics in your home can last for years with optimal care, commercial varieties are expected to last a decade or more. It’s important to find the best commercial carpet cleaning services to ensure that your company’s floors look great and retain their allure for years to come. Maintaining your carpets will help to remove dirt and debris. If you do not regularly clean your carpets, this dirt can grind into the fabrics and cause damage. The primary way to preserve the quality of residential and commercial carpets is to vacuum, with homes often requiring cleaning every one to two weeks. Commercial carpets, on the other hand, experience a lot more traffic and take on a lot more dirt and grime. Professional cleaning services are often required much more frequently, with extensive deep cleaning measures typically done at least twice annually. Commercial carpets require much more intensive servicing to retain their aesthetics, requiring property managers to schedule services and maintenance regularly. Investing in a quality cleaning service can yield great results for your business. Crystal Clear Enterprise is proud to deploy state-of-the-art equipment and the most advanced methods to deliver the best possible results for each of our clients. We also utilize the best janitorial technology in the industry to ensure that your facility is comprehensively cleaned on a consistent basis. From last-minute customer requests to employee accountability measures, our Automated Management System (AMS) ensures that nothing is overlooked. No matter how well you manage your facility, the overall impression that people receive on your building will depend heavily on the property’s overall cleanliness. Hiring a commercial cleaning company that does not provide the very best services can cost you in more ways than one. Crystal Clear Enterprise is proud to provide Top Rated Local® janitorial services to Kansas businesses, utilizing the best training and the highest standards to deliver a superior outcome for each of our clients. We are now certified for our carpet cleaning services with the Institute of Inspection Cleaning and Restoration Certification (IICRC), which works to set the highest standard for the cleaning industry. The carpets in your home are designed much differently from the ones throughout your business, and it’s important to find a carpet cleaning company that understands the differences to provide the best possible outcome. Since 1997, the Crystal Clear team has worked to provide unbeatable carpet cleaning services to Kansas City businesses, setting the highest standards that reflect the quality of our work. This outcome results in a clean, pristine facility that is sure to impress employees and guests alike. If you’re in need of professional floor cleaning services, janitorial services, or specialty work, be sure to contact us today for a quick and accurate quote!